Associate Member, Indian Institute of Architects. Member, Indian Society of Lighting Engineers. 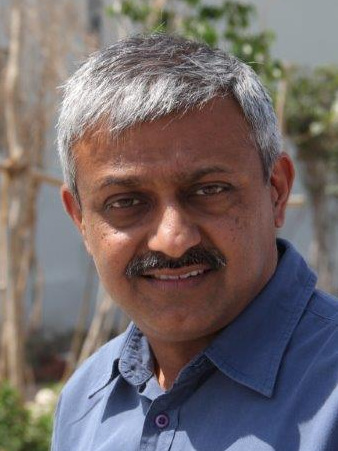 Deepak Gahlowt is an architect with 24 years of diverse experience in architecture, adaptive reuse, building traditions, sustainability, project management, facility management, energy efficiency, standards writing and building bye-laws, advocacy, training, research and writing. Deepak is currently Director, Xebec Design and Facilities Pvt Ltd and other Xebec companies; he is the Convener of Confederation of Construction Products and Services (CCPS); and continues to also work as an independent consultant. Other than starting Xebec as a design practice and leading it to transform into an integrated design-build-manage company; he was instrumental in formation of CCPS; and has published and edited a respected professional journal; and written for mainstream magazines and newspapers. He has led and worked on developing and writing standards on safe use of glass in buildings for India; standardization of doors and window sizes; and has contributed to the Energy Conservation Building Code for India (ECBC). He has lectured on alternate strategies for true sustainability; conducted training programs for practicing architects and construction managers across India; has advised companies on building materials and construction processes; worked in the field tradition and arts; and has consulted with governments, NGOs, and International Agencies. He is a member of a range of national committees with Bureau of Indian Standards, Confederation of Indian Industries, Confederation of Construction Products and Services and continues to stay involved with a range of diverse activities. Member, CII National Committee on Real Estate & Housing. Ongoing. Governing Council Member, Indian Buildings Congress. Complete. Invited to World Flooring Forum, 2010 at Shanghai by China National Forest Producst Industry Association as a sponsored speaker. Complete. Invited to a Private Sector Consultation Meeting in London organised by Royal Institution of Chartered Surveyors (RICS) on behalf of the Food and Agriculture Organization of the UN (FAO) to review and help finalize a draft discussion paper on FAO voluntary guidelines on responsible governance of tenure of land and other natural resources land tenure. Complete. Invited to the International Solar Energy Society – Asia Pacific – 08 conference in Sydney as a delegate and participant in Developing Country and Buildings conference streams with funding by AusAid. Complete. Bureau of Energy Efficiency, Government of India, Adviser, Energy Conservation Building Code (ECBC-2007). Helped in developing the technical sections of the code. Complete. Project Managers for renovation of Express Towers, an iconic 28 storey commercial building at Nariman Point, Mumbai built in 1969 and designed by Joseph Allen Stein. The work involves Complete upgradation of all MEP systems, incorporating about 6MW of connected load, 1800 TR of central AC chiller, about 48 AHUs, complete plumbing, Fire fighting and IBMS; Interior for 25 common lobbies, External facade and structural restoration, all in an occupied building with headquarters of some of the most premium Indian and International tenants. Builtup area 400,000 sqft approx. Client: ICICI Venture and Indian Express Newspapers. Status: Complete. Project Managers for restoration and conversion of about 150 year old building structure at Nakki Lake for use as a Boutique Hotel. Client: Gaj Singh ji of Jodhpur. Status: Complete. Revitalisation Proposal for Ghat ki Guni, Jaipur. Done in association with Panika, Ahmedabad, for submission to the Government of Rajasthan for development of in form of a Public-Private Partnership through the Build and Operate method. Client: Mr Vikram Golcha. Status: Complete. Advisor, Jaipur Virasat Foundation, on Vikas and Virasat Initiative, 4-year pilot program conceived as a single, umbrella mechanism to develop a heritage-based economy across the state in partnership with the Government of Rajasthan. Client: Jaipur Virasat Foundation. Status: Complete. Member Governing Council and Member Working Group, Stone Crafts Foundation, Government of Rajasthan,. Wrote the background paper and influenced setting up of the foundation. Instrumental in getting the Stone Crafts Manual Project started under the foundation. Client: Government of Rajasthan. Status: Complete. Consultancy relating to Design, Construction Supervision and Operation Management of public facilities at the world famous Amber fort, Jantar Mantar, Albert Hall Museum and Hawa Mahal. Client: Amber Development and Management Authority. Status: Complete. Large areas of the Zenana Mahal, City Palace, Udaipur, built originally in the 15th century were adapted to accommodate the central corporate offices of the HRH Group of hotels and various other companies and trusts. The Palace faced the Pichola lake on the west and open public court between the Zenana Mahal and Mardana Mahal in the city palace complex. The corporate offices were accommodated in a manner that the original character of the place was retained and modern services and facilities were introduced. Client: HRH Group of hotels. Status: Complete. Site supervision and coordination of restoration works of the roof at Viceregal Lodge (now Indian Institute of Advanced Study), Shimla, Himachal Pradesh, with Central Public Works as contractors. Client: INTACH. Status: Complete. Project manager for documentation and conservation Report, Viceregal Lodge (now Indian Institute of Advanced Study), Shimla, Himachal Pradesh, done with Mr. K T Ravindran (phase 1) and Mr. Romi Khosla (phase 2). Client: INTACH. Status: Complete. Project Coordinator. Vision plan and proposal on restoration and revitalisation of Jaleb Chowk, including documentation of the Jaleb chowk and its surroundings in the City Palace Complex, Jaipur; and report for the government outlining the restoration and reuse strategy. Done with Mr Rajiv Sethi. Client: Government of Rajasthan. Status: Complete. Project initiator and coordinator, for Restoration of over 13 traditional homes and havelis on a street in the old city of Jaipur. Funded by Prince Charles Foundation, UK. Done in association with Jaipur Virasat Foundation. Client: Government of Rajasthan. Status: Complete. Coordinator, Conserving Heritage in a Developing Metro: The Jaipur Experience, one day workshop. Client: Confederation of Construction Products and Services. Status: Complete. Institute of Advanced Study) campus, Shimla, Himachal Pradesh. Client: INTACH. Status: Complete. Getty Grant report on Viceregal Lodge (now Indian Institute of Advanced Study), Shimla, Himachal Pradesh. Client: INTACH. Status: Complete. Inspection Report, on Heritage buildings / structures on Kalka - Shimla section, Shimla Railway Station and Bikaner Railway Station for Indian Railways. Done on behalf of INTACH. Client: Indian Railways. Status: Complete. Executive Dining Room within the City Palace complex, Udaipur. Designed in an existing old structure inside the city palace complex with construction of additional structures as per the requirement maintaining the old character of the palace complex. Areas include dining space for 120pax, Kitchen, washing spaces, cold rooms, administrative spaces etc. External landscaping of facing court. Client: HRH Group of hotels. Status: Complete. Documentation of structures within the City Palace Complex, Udiapur. For the City within the City Project. Client: Maharana Mewar Charitable Foundation. Status: Complete. Documentation report and structural analysis of Darbar Hall, Quila Mubarak, Patiala, Phase 1. Done in Association with Ar Gurmit Rai. Client: INTACH. Status: Complete. Site supervision and coordination of restoration works with the senior architect Rosemary Sachdeva at St. James Church, Kashmiri gate, Delhi. Client: INTACH. Status: Complete. Conservation report, Bade Khan Ka Gumbad, New Delhi. Client: INTACH. Status: Complete. Conservation report, Nag Vasuki Temple Complex, Allahabad. Client: INTACH. Status: Complete. Listing and grading of monuments at Chitrakoot, UP and MP and at Allahabad. Client: INTACH. Status: Complete. Measured Drawing of Roomi Darwaza and Ramparts of Imambara complex, Lucknow. Client: INTACH. Status: Complete. Setup and mangaging the CCPS Real Estate Data Initiative. Successfully completed a pilot project with Municipal Corporation of Delhi involving development of the accepted format and collection of Building Permit data for 6 months. Complete. Special Invitee to the Reserve Bank of India Technical Advisory Group on Development of Housing Start-Up Index in India. Made presentation to the committee including Mr. Rakesh Mohan, Deputy Governor, on Building Permit Data collection systems for India. Supported Prof Amitabh Kundu, Chairman of the Reserve Bank of India committee. Complete. Convener, Steering Committee, CCPS Guidelines for Use of Glass in Buildings – Part 1 Human Safety. Instrumental in developing the guidelines thru the consensus method involving stakeholders from both the governemntal and private sector. Accepted and mandated by CPWD as a model PPP example of standards development; accepted as part of Compulsory Building Bye Laws by the state of Andhra Pradesh and Rajasthan; and working with other state governments for inclusion in Building Bye Laws. Ongoing. Started and managed the CCPS Doors and Windows Standardisation Initiative and worked with the Committee on Doors and Windows Standardization, setup by CPWD, Government of India. Now a compulsory requirement for all Government of India residences to use standard sized doors and windows. 2005. Completed. The Indian Hotels Co. Limited (Taj Group of Hotels), Advisor, Project Wildfire; 2002. Complete. Conducted several training programs on Lighting and Glass use in buildings at CPWD Training Institute, Ghaziabad and other occasions. Complete. Member, Expert Committee, Interiors Design Curricullum, Indira Gandhi National Open University. Complete. AIS Glass Solutions, Knowledge Program Advisor, and Trainer, Selection of Appropriate Glass for Buildings, Conducted over 45 training program for Architects and Engineers across the country. Complete. All India Flat Glass Manufacturers Association, Advisor, Guidelines for Use of Glass, 2002-03. Complete. Reckitt Benckiser, Report on Wax Polish use in Buildings: 2002, Complete. Former Publisher and Editor, Construction Journal of India; 1998-2002. Complete. Article and photo essay on role Border Roads Organisation in the Kargil War. Travelled with BRO and Indian Army Engineers Unit across the Srinagar-Leh road and the Leh-Manali road. Complete. Editor, Is Delhi Prepared? Earthquake Floods and Fire, a special publication on disaster preparedness of Delhi and its regions. Complete. Lectures on Architectural Heritage of India at IIT Kanpur; 2002 & 2003. Complete. Script - Promotional film on Lighting for Indian Society of Lighting Engineers. Complete. - Film on Architectural Heritage of India. Complete. Lectures on Glass use in buildings, Buildings standards, sustainability in built environment, lighting design etc across much of the country. Indian Society of Lighting Engineers - Formulated and Coordinated the Ist, 2nd and 3rd ISLE Lighting Design Competitions sponsored by Philips, Bajaj Lighting and Crompton Greaves (1991, 1995, 1998); Edited the catalogue of entries for the 1st ISLE Lighting Design Competition, '93; Editing of Proceedings and Technical Papers - SAARC, IDMY and the International Lighting Conference, Prakash 1991. Complete. Research Associate with Mr. N.S. Johri, Retired Chief Town Planner, UP on revision of Master Plan, Lucknow. Complete. Articles published and works featured at various times in Hindustan times, Times of India, Business Standard, Economic Times, Financial Express, Pioneer, CNBC, Zee Business and other publications and TV Channels.